U.S. Christmas tree growers harvested and sold 20 million trees last year, up 55 percent in 5 years. From the smell of fresh pine, to the vibrant colors of poinsettias, the holiday season is the perfect time of year to spotlight America’s horticulture growers through the just released 2014 Census of Horticultural Specialties report. I’ve experienced firsthand how unique and amazing this industry is by working nationwide with producers and stakeholders as USDA’s National Agricultural Statistics (NASS) nursery and floriculture commodity specialist. For example, did you know farmers can invest more than 8 years growing a Christmas tree for harvest? While there are not many producers dedicated to this work, according to our latest report industry sales grew. 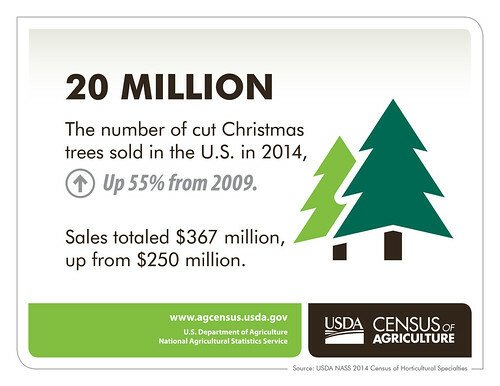 In 2014, there were 3,386 Christmas tree producers in the United States. That year there were a total of 20 million cut Christmas trees sold, valued at $367 million in sales. This was a significant increase from the last report in 2009, when only 13 million trees were cut and sold for a total of $250 million. Oregon, North Carolina and Michigan continued to rank top in the nation for number of trees sold, as well as value of sales. With 15.4 million trees cut and sold, growers in these three states accounted for nearly 78 percent of all cut Christmas trees sold in the United States in 2014. If you have a favorite variety of Christmas tree, the horticulture census also provides data on 10 species of cut Christmas trees grown in the United States. Of those 10 species, the most popular were firs. The top three were Fraser fir, Noble fir and Douglas fir, which accounted for 83 percent of all trees sold. Besides cut Christmas trees, a poinsettia can add natural color to any space for the holidays, large or small. There are 1,527 horticultural growers who reported sales of the potted plant in 2014. These producers sold 50.4 million poinsettias valued at $241 million. The state growing the most of these treasured holiday plants was California, with 7 million poinsettias sold. This season, I encourage you to celebrate the natural bounty and beauty the U.S. horticulture industry provides by exploring more data online. Access the complete 2014 Census of Horticultural Specialties today. 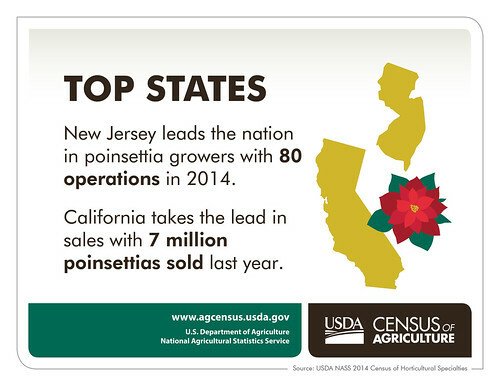 The Garden State and the Golden State lead the nation in poinsettias, from number of growers to number of plants sold (respectively). Douglas fir is not a member of the genus Abies and is therefore not a true fir. Sales hence the study of economics is important in understanding why we should invest in this Christmas tradition. A little history of the first Christmas tree brought to the white house or the legend of the poinsettia would help to promote the holiday tradition a little more. I think people are starting to open their homes up more to the nostalgia of holiday stories and floral legends. Chestnuts being roasted and the classics are bringing meaning back to a holiday that means so much to families. Its nice to see states doing so well. Thanks for the update.